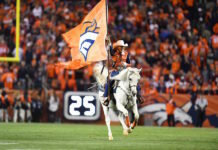 Despite the final result, Denver’s Week 11 matchup with the Los Angeles Chargers (7-3) was still filled with frustration for Broncos Country. The Broncos found a way to steal a 23-22 victory on Sunday, but for the most part it was an ugly game for Denver. Prior to the two-minute warning, Case Keenum had completed 53.8 percent of his pass attempts for a mere 119 yards and an average of 4.58 yards per attempt. Paired with questionable coaching decisions and a patchwork secondary, there was more than enough for the Broncos faithful to be upset about. But let’s first take a look at some positives. In rookie running back Phillip Lindsay, the Broncos have found an offensive identity for the foreseeable future. Lindsay has been one of the most valuable players for the Broncos offense this season, but on Sunday you could certainly argue he was the most valuable. 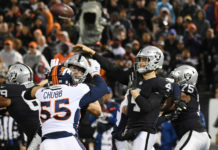 Prior to the Broncos’ game-winning drive, Lindsay accounted for 44.35 percent of Denver’s total yardage, and just over 50 percent of Denver’s points (12). What’s more, Lindsay’s two scores displayed just how versatile the young back is. Lindsay’s first touchdown came on a 41-yard scamper, showcasing Lindsay’s fantastic burst and speed. The second was on a direct snap, highlighting Lindsay’s power and vision. To pair with its hard-nosed running game, Denver has a few nasty pieces on the defensive side of the ball in Bradley Roby, Von Miller, and Bradley Chubb. Roby has been a liability in the Broncos’ secondary all season, but on a day when the rest of the secondary was flat, Roby rose to the occasion. Early in the game, Roby made his presence his felt when he laid out Melvin Gordon, who was trying to take a sweep around the edge. Later in the half, Roby disrupted a deep shot to Travis Benjamin in the endzone, a vital play which led to Los Angeles having to settle for a field goal. With Roby holding down the backend, Von Miller and Bradley Chubb continued to suffocate opposing quarterbacks. The duo played to the level Broncos fans have come to expect, as each collected a sack. Chubb managed to land a couple of stingers on Rivers to boot, but he was most impressive in the run game. Chubb’s motor and strength makes him one of the Broncos’ more stout run defenders, incredibly promising from a rookie. The star of the game though, was Chubb’s mentor, Von Miller. 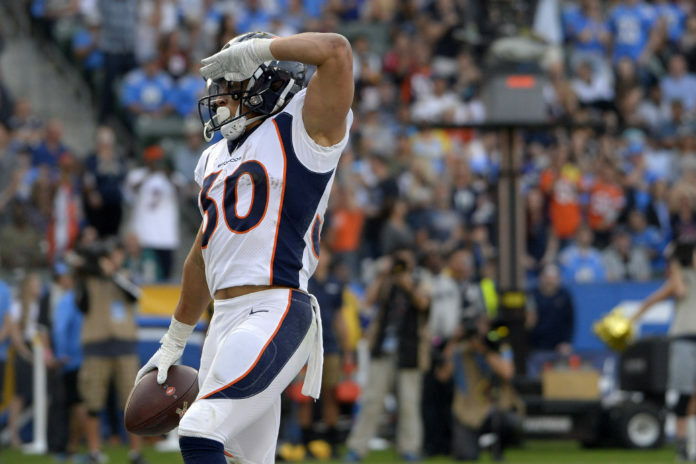 Miller undoubtedly made the most pivotal play of the game when he intercepted a screen and returned it deep into Los Angeles territory, leading to Denver’s second score of the game. The interception also swung the momentum back in Denver’s favor. 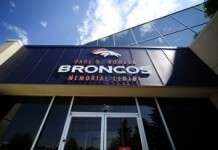 Without it, it’s hard to picture a scenario where the Broncos win and head coach Vance Joseph makes the flight back. Once again, Vance Joseph and his staff made poor decisions in regards to game management that put the team in an unnecessary hole. This was never more evident than in Joseph’s decision to go for it on fourth down, at the Chargers’ ten yard line with a 7-6 lead early in the game. Another instance of what appeared to be the coaching staff making a decision based on their record and ‘desperation’. To make matters worse, the coaching staff then opted to punt, trailing at the end of the half, just outside field goal range. I don't want to just sit here and bash coaches, but I've sat through Vance Joeseph's career and my goodness he is consistent in making the absolute wrong calls. Not taking points when he should and chasing them when he shouldn't. The coaching staff also missed an opportunity to challenge the ruling on Denver’s missed two-point try, which appeared to be an easy call to overturn. On the bright side for Joseph, he now has first road win on a day other than Thursday. Somehow more frustrating than the coaching decisions, was the Broncos’ poor secondary play. Despite recording an interception in the game, cornerback Chris Harris Jr. was feasted on by quarterback Philip Rivers. Harris was burned multiple times by Keenan Allen, a rare sight for any Broncos fan. Along with Harris’ struggles, Denver had no answer for the Charger tight ends. Antonio Gates, who through eight games had eight receptions for 61 yards, played like his old self-catching five passes for 80 yards and a score. Gates picked on everyone, torching Su’a Cravens, Justin Simmons and Josey Jewell at different moments in the game. Hopefully Denver can shore up their defense before they face Pittsburgh in a Week 12 matchup with the Steelers.